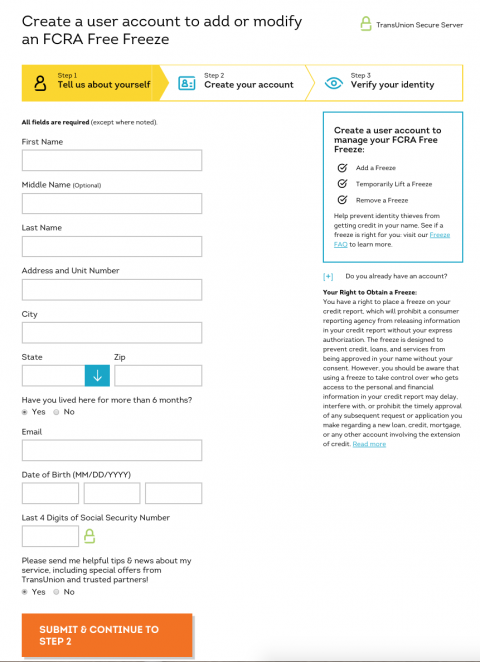 TransUnion requires that you set up a password-protected account before you can request a credit freeze online. The best way to keep fraudsters from using your credit data is to get a credit freeze. This safeguards your records and keeps identity thieves from being able to use your credit identity to open new accounts. Unless you know you will soon need to access your credit, a credit freeze, also known as a security freeze, is worth considering. But if you anticipate needing to grant access to your credit data frequently or soon — for instance, you’re applying for a new account, job or apartment — a fraud alert may be a better option. Credit freezes have to be set up individually with each credit bureau: Equifax, Experian and TransUnion. Lifting freezes also has to be done individually. Credit freezes and thaws are free for all consumers. You will have to establish a TransUnion account in order to freeze your TransUnion credit online. You can also download and use an app if you prefer. You do not have to have a TransUnion account to place a security freeze by mail or by phone. To open an account, or to freeze, you will be required to provide your name, the last four digits or your Social Security number, your address and birthdate. Note that above the “submit and continue” button is consent to send emails from TransUnion and partners. The default is yes. You will need to change it if you do not wish to receive them. You will then be asked some identification questions, such as street numbers for past addresses, when credit accounts were established or approximate payment amounts on loans. To open an account, or to freeze, you will be required to provide your name, Social Security number, address and birthdate. Important: While there are many monitoring products that can be purchased on the site, be careful to sign up only for the free credit freeze, if that is what you want. You should see references to a free freeze when you sign up. You can place the freeze and choose a PIN. If you do not choose a PIN, you will be assigned one. You will need the PIN to unfreeze your credit file if you want to do it by phone. You do not need it to freeze or unfreeze online. You can still access your own file to check credit activity. You can check your free credit report summary from TransUnion on NerdWallet as often as you wish. To freeze your credit by mail, send your request to TransUnion LLC, P.O. Box 2000, Chester, PA 19016. You will need to include your legal name, address, birthdate and Social Security number, along with copies of documents verifying your identification and address, such as driver’s license, passport, utility bills, etc. TransUnion notes that mail is the slowest way to freeze credit. Once a freeze is in place, you will get a randomly generated PIN in the mail. Consumers may also initiate a freeze by calling 888-909-8872. You can complete the process using an automated system or opt to speak with an agent. Basic information — full name, any suffixes such a Jr., address, birthdate and Social Security number — will be required, and you may have to answer authentication questions as well. Consumers who opt for the automated system will get a randomly generated PIN, but those who speak with a live agent will be able to choose, a TransUnion representative said. Credit freezes must be lifted individually with each bureau. If you’re making a single credit application — say, getting preapproved for a car loan or an apartment — you may be able to find out which credit bureau’s data is used and unfreeze just that one, saving some time. If unfreezing online, you’ll log in as you did to place the freeze. You will need the PIN if you lift a freeze by postal mail or phone.